We clean deeper and keep carpets, rugs or upholstery cleaner for longer. Dirt, grime, and allergens are no match for Chem-Dry’s unique cleaning technology. At Chem-Dry Clean & Fresh Carpet Cleaning Services Eastwood, we believe in sustainability and have worked toward offering a Green Non-Toxic solution to Carpet Cleaning. Combine our main solution 'The Natural' with our low moisture 'Deep Cleaning system' and your carpets will be restored leaving them feeling soft, Clean and Fresh. Imagine that? Indoor air quality is a significant home health concern because the average home harbors about 200,000 bacteria for every square inch of carpet. As the bacteria builds up, the bacteria lurking in your carpets gets stirred up and circulates in the air your family is breathing unless you clean it. 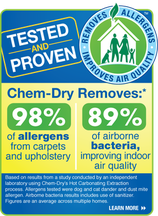 Chem-Dry Clean & Fresh Carpet Cleaning Eastwood is not only effective at removing the bacteria from the carpets we clean, but it also improves the air quality in your home. The same leading independent air quality laboratory found that, when adding sanitiser to our Hot Carbonation Extraction carpet cleaning process, we removed an average of 89% of the bacteria in the air and 82.3% of the bacteria from carpets. ​Did you know too much water can promote mould, mildew and bacteria growth in carpets? Our process uses far less water which is not only healthier but dries in 1-2 hours instead of 1-2 days.